English 18th century calf; in red morocco case. Purchased by J.Pierpont Morgan (1837-1913) in Mar. 1901. 420 leaves (1 column, 30 lines), bound : vellum, ill. ; 220 x 150 mm. Made for Guy de Castelnau-Bretenoux after he became bishop of Périgueux in 1511; Castelnau arms quarterly 1 and 4 gules a castle with 3 towers (Castelnau); 2 and 3 azure a lion argent (Calmont) surmounted by a papal protonotary's hat, which is black; collection of Philip Stanhope, 3rd Earl of Chesterfield (1673-1726); Joseph Smith sale (London, 1773, no. 1196) to M. Wodhull; his sale (London, 1886, no. 495) to Quaritch, cat. 99 (1889) no. 354; cat. 118 (1891), no. 484; cat. 138 (1893), no. 135; cat. 154 (1895), no. 17; purchased by J. Pierpont Morgan (1837-1913) in Mar. 1901; J.P. Morgan (1867-1943). Ms. breviary for the use of Rome (Hours of the Virgin, Office of the Dead); written and illuminated in France, possibly southern France, ca. 1511. 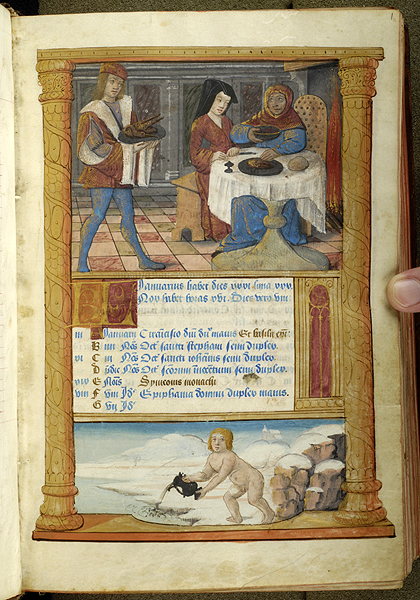 Decoration: 139 miniatures; illuminated borders throughout; decorated initials; titles in blue.